You are here: Home / Giving Back / Are You Afraid of Sending Balikbayan Boxes in December? 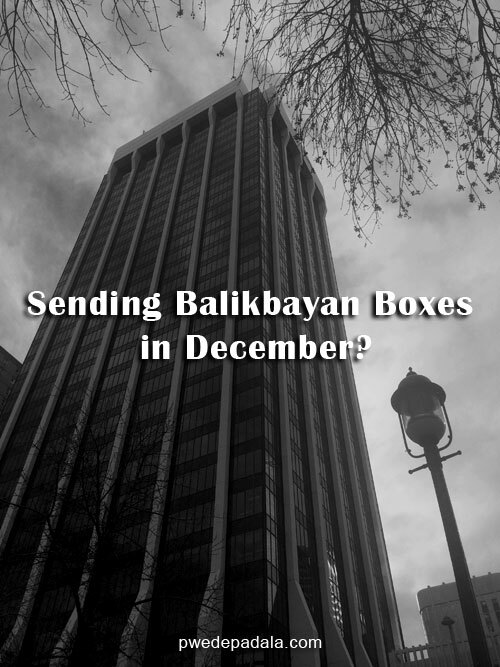 Are You Afraid of Sending Balikbayan Boxes in December? Sending balikbayan boxes in December wasn’t in my plan. It is a superstitious belief of OFWs that I’ve been hearing as a child. My excitement of opening boxes coming from Canada is off season in December. And I carried that belief till such time that it is time for me to send balikbayan boxes from Canada. So where does this notion comes from? Do NOT send balikbayan boxes in December. There are stories of unfortunate events from my relatives and others; stories passed on from one generation of OFWs to the next. I remember when I was a child, our family received a balikbayan box from a relative in Canada. No way can anyone cover up the committed wrongdoing. When I came here in Canada. I hear the same terrifying stories and advice. Do NOT send balikbayan box in December. Someone else might open and get whatever they want from the box. The boxes probably will arrive in the last week of January or first week of February 2017. I spent $70.00 CAD for each box; it is the current fee of shipping from Calgary to Manila. I’ll update this blog post to let you know how things went through. For now I’ll hold on to the invoice and inform my family about the tracking number so they can check the whereabouts of the boxes. I hope they make it in our home . . . regardless of how long. Update: My boxes made it to the Philippines. All of them. Did you experience something unpleasant in sending balikbayan boxes? Some items are stolen or the whole box is missing? Share in the comment.